I recently purchased a neat product, the Garmin vívosport. It’s a slim fitness band with real waterproofness and GPS tracking, perfect for water sports. Garmin devices are usually fairly hackable, with simple filesystem access to well-defined FIT files. I was also recently introduced to Strava, a social network that lets you post “activities” (e.g., bike rides) generated by fitness devices like my vívosport. Right now, my Strava profile consists of nothing but short and clumsy windsurfing activities at the Berkeley Marina. 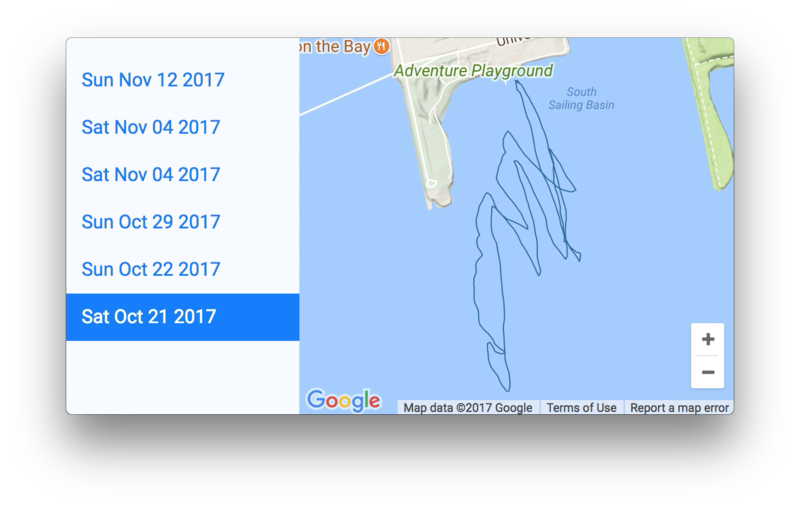 These GPS tracks look like child’s scribble because I’m definitely a beginner at windsurfing. They are surprisingly accurate; I can even tell which of the three docks that I launched from. In addition to requests, I also used flask because my Python script is actually a miniature web server. The script is used only for one-time generation of a JSON file, but it needs to act like a web server because it receives an auth token from Strava after the user logs in. Google Maps lets you draw arbitrary graphics over a map using OverlayView, which corresponds to an absolutely-positioned <div> that floats over your map. In onAdd, I create a single <svg> that auto-expands inside the div. I also specify the viewBox attribute, which lets me avoid updating an overall SVG transform every time the div changes size (i.e. when zooming). Update the left/top/width/height attributes of the overlay div. Update the stroke width of the path. Since I’m using D3, it was easy to throw in a transition animation. However each Strava path has a different number of points, which complicates things. I stumbled across Peter Beshai’s implementation of interpolatePath, which handles this quite nicely. // If this is the first time drawing the path, no need to animate.